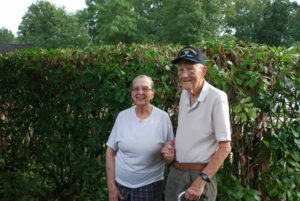 Bonnie and Creed Smith of Indian Trail received a wonderful surprise Friday and Saturday when a team from Union County Public Schools came to help with yard work and the windows as part of the United Way Day of Caring. Bonnie is 91 and Creed is 92. They have been married for 72 years. They were nominated by someone in the community and had no idea they would receive the help. Creed said he is “thrilled” that members of the community took the time to help them at the house. The team helped with trimming bushes, weeding and cleaning the windows outside. The Smiths have lived in the neighborhood for about 14 years. They are originally from Kentucky, though moved around due to Creed’s time in the military during World War II and his job in sales. Bonnie said they cannot do much around the house anymore. Creed said they had never needed extra help as they do now, but he is grateful for the help they have received from the community, including a local man who helps mow the lawn. He said it was a blessing that humbled him. Their secret to marriage is fairly simple. Bonnie said they respect the Lord and each other. They carry on conversations together until they find happiness and work things out. She said that she cannot see as well anymore and her husband can see and he cannot hear as well anymore and she can hear, so they must work together, a sentiment echoed by Creed. Tom Bulla is the director of HR operations for Union County Public Schools and has served on the United Way Day of Caring committee for about 10 years. “It’s an amazing feeling to help behind the scenes,” he said. He said the people at the work sites feel they are receiving something, but he believes he and his teammates are getting more from the volunteer work than they are. Union County Public Schools has partnered with the United Way for many years, Bulla said it is a natural fit. Union County has one of the largest day of caring events in the region in terms of volunteers.